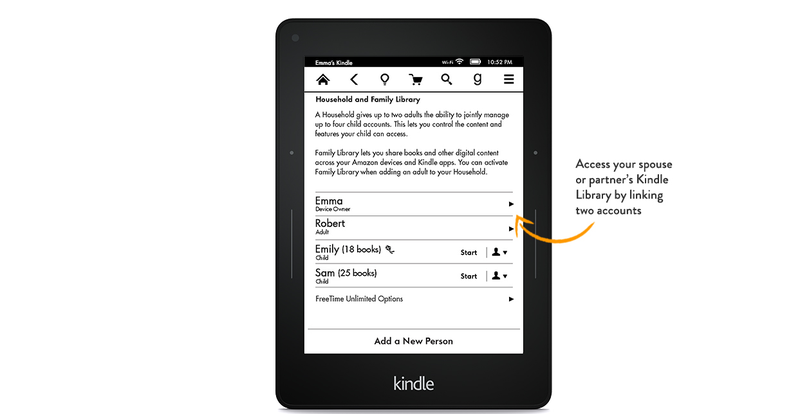 Kindle announced an update today that lets people share books they've purchased with their family. Amazon let people know a family sharing program was coming a few months ago, and now it's finally here. The Household and Family library will give two adults the power to share books between their accounts, as well as four child accounts. The feature will work on Kindle readers, but it'll also work on third-party devices running the Kindle app, which is great. Really, the only bad part of the new plan is that the sharing doesn't apply to purchased music, movies, or TV shows. The Kindle update also included a dictionary feature called Word Wise, meant to help kids expand their vocabularies while they read. Turning Word Wise on will prompt definitions to automatically appear over difficult words. You can download the software update today from the Amazon website.